The Karmapa is one of the most important holders of the teachings of Tibetan Buddhism. The first Karmapa, Dusum Khyenpa (1110-1193), one of the most prominent lamas of his time, indicated prior to his death that he was to take rebirth again in Tibet. The second Karmapa, Karma Pakshi (1204-1283), was thus the first reborn lama of Tibet. Since then, the Karmapas continued to reincarnate in Tibet and to guide the Karma Kagyu tradition. The Karmapa incarnates have always proven themselves as authentic Karmapas and were confirmed as being the Karmapa’s reincarnation by a realized disciple of the respective previous Karmapa. Their biographies show their extraordinary qualities in terms of their vast knowledge, their pure conduct and their compassion. They always made great efforts in studying the buddha-dharma, reflecting on it and in their meditation and they always displayed extraordinary abilities in teaching the dharma, helping their disciples to clear their doubts and in composing treatises to support others on their spiritual path. The Karmapas are therefore considered to be great bodhisattvas who manifest in our world for the welfare of others. In the course of their reincarnations they have always contributed towards an authentic transmission of Buddhism in Tibet. The 16th Karmapa, Rangjung Rigpe Dorje (1924-1981), was furthermore instrumental in making Buddhism and in particular its Kagyu school accessible to the West. His Holiness Karmapa is the head of the Karma Kagyu school of Tibetan Buddhism. Born in 1983 in central Tibet, he began telling his parents, the great Nyingma lama Mipham Rinpoche and Dechen Wangmo, that he was the Karmapa almost as soon as he could speak. Traditionally, the Karmapas are said to recognise themselves in each incarnation. Following the tradition of many centuries, the child was tested and formally recognised by the highest lama in the Karma Kagyu after the lineage head himself, the 14th Shamar Rinpoche, and given the name Trinley Thaye Dorje, meaning Limitless Unchanging Buddha Activity. Having escaped from Chinese-controlled Tibet in 1994, His Holiness Karmapa has lived in New Delhi and Kalimpong for many years. He travels extensively throughout India, attending significant events such as the Kagyu Mönlam in Bodh Gaya each year, teaching and granting empowerments to students.He has also visited many countries in Asia and Europe, as well as Russia, starting with giving empowerments to thousands of students in Taiwan and Singapore in 1999 and continuing actively to this day.His formal education was completed in 2003, at which time he received the title of Vajracharya, or Great Tantric Master. 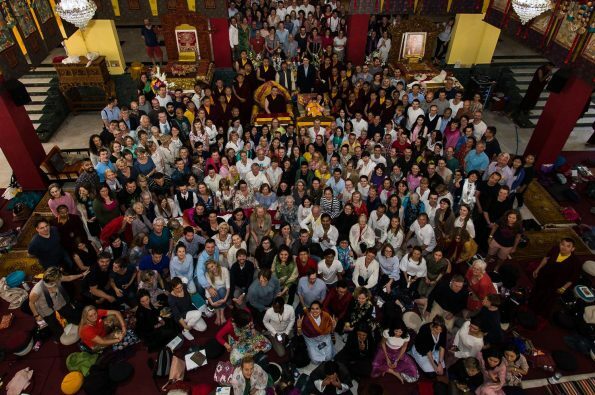 His Holiness Karmapa has the spiritual responsibility for over 900 monasteries and meditation centres worldwide, including the Karmapa International Buddhist Institute (KIBI), which runs courses in Buddhist higher education. Movies: The Lord of the Rings Trilogy, Star Wars. Tv: BBC and CNN news are great for opening one’s eyes – a way to connect to the world. Books: I have read mostly Dharma books. These are books about Buddhism.